1:40 p.m., Aug. 6, 2010----A University of Delaware researcher reports that an “ice island” four times the size of Manhattan has calved from Greenland's Petermann Glacier. The last time the Arctic lost such a large chunk of ice was in 1962. 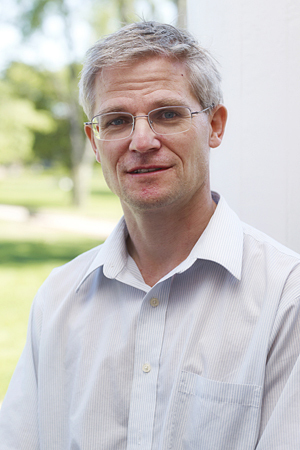 “In the early morning hours of August 5, 2010, an ice island four times the size of Manhattan was born in northern Greenland,” said Andreas Muenchow, associate professor of physical ocean science and engineering at the University of Delaware's College of Earth, Ocean, and Environment. 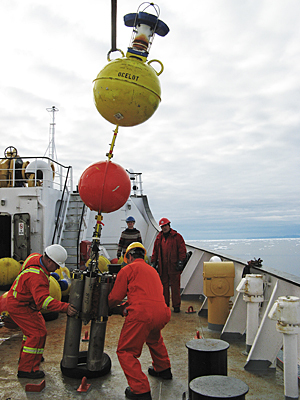 Muenchow's research in Nares Strait, between Greenland and Canada, is supported by the National Science Foundation (NSF). 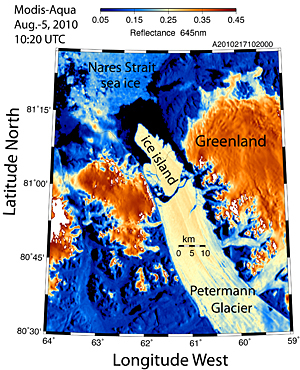 Satellite imagery of this remote area at 81 degrees N latitude and 61 degrees W longitude, about 620 miles [1,000 km] south of the North Pole, reveals that Petermann Glacier lost about one-quarter of its 43-mile long [70 km] floating ice-shelf. Trudy Wohlleben of the Canadian Ice Service discovered the ice island within hours after NASA's MODIS-Aqua satellite took the data on Aug. 5, at 8:40 UTC (4:40 EDT), Muenchow said. These raw data were downloaded, processed, and analyzed at the University of Delaware in near real-time as part of Muenchow's NSF research. The new ice island has an area of at least 100 square miles and a thickness up to half the height of the Empire State Building. “The freshwater stored in this ice island could keep the Delaware or Hudson rivers flowing for more than two years. It could also keep all U.S. public tap water flowing for 120 days,” Muenchow said. 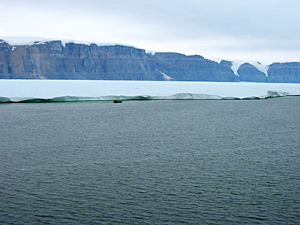 The island will enter Nares Strait, a deep waterway between northern Greenland and Canada where, since 2003, a University of Delaware ocean and ice observing array has been maintained by Muenchow with collaborators in Oregon (Prof. Kelly Falkner), British Columbia (Prof. Humfrey Melling), and England (Prof. Helen Johnson).